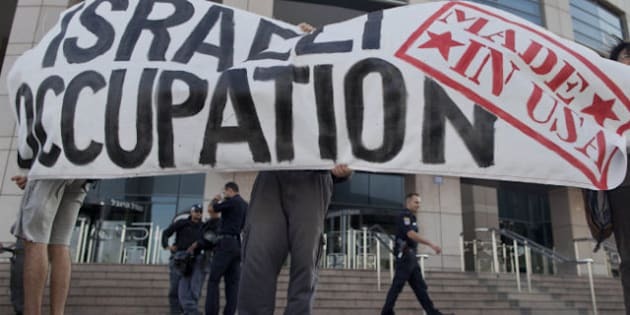 THE CANADIAN PRESS -- JERUSALEM - Some 120 foreign activists were being held in Israeli jails Saturday, awaiting possible deportation, after arriving at Tel Aviv's airport over the weekend as part of a solidarity mission with the Palestinians, a government official said. Others who managed to get through Israeli border controls travelled to the West Bank where some joined a demonstration against Israel's separation barrier. Associated Press Television footage showed some foreign activists, along with Palestinians, cutting through the barrier's barbed wire fence with clippers. Another protester started a small brush fire. The Israeli military said about 150 protesters gathered near the barrier just north of Jerusalem. Some threw rocks at soldiers who fired tear gas to disperse them, the army said. There were no reports of serious injuries. One of the activists, Michael Berg, 36, from St. Louis, said he attended the protest but was not involved in vandalism. Organizers said a small number of the foreigners who participated in cutting the fence were among those who had flown in on the solidarity mission, while others had arrived in the West Bank previously. The Palestinians oppose the barrier as a land grab because it frequently juts into the West Bank, swallowing up Palestinian farmland and properties. Israel says the structure, built in response to a wave of suicide bombings a decade ago, is a security measure. Israel had previously expressed concern about the "fly-in," saying it feared some of those trying to reach the West Bank would engage in violence. Initially, some 600 foreign activists planned to fly to Tel Aviv over the weekend for what they said would be a peaceful weeklong mission in the West Bank. Israel controls all access to the West Bank, and those trying to reach it have to enter through Israeli-held crossings. Israel took a series of measures to try to avert the mass arrival and weed out those it considered troublemakers. Israeli authorities, using information gathered on Facebook, Twitter and other websites, compiled a blacklist with more than 300 names and asked foreign airlines to block those on the list from boarding Tel Aviv-bound flights. Hundreds more landed at Tel Aviv's airport over the weekend, and more than 400 were questioned by police, said Interior Ministry spokeswoman Sabine Haddad. Of those, 130 were detained and six sent home immediately, she said. Another four signed forms promising not to participate in violent activities and were granted entry to Israel, she said. Haddad said all those currently in detention were offered to be released if they signed the forms. The remaining 120 were being held at two Israeli jails while they weighed their options, Haddad said. It was not clear when they would be deported. Palestinian organizers of the "Welcome to Palestine" movement estimated that anywhere from 12 to 100 foreigners had managed to reach the West Bank through the fly-in, with others expected in the coming days. Some travelled in earlier in the week while others appeared to have concealed their intentions. Berg said he was not questioned at the airport and speculated that was because he did not say he wanted to "visit Palestine" as others had done. "I am a Jew and what is happening here is wrong," Berg told The Associated Press. "I don't want what is happening in the West Bank to be done in my name," he said. Mustafa Barghouti, a Palestinian organizer of "Welcome to Palestine," said the movement planned additional gatherings throughout the West Bank. "Israel is stupid. They believe they will stop us," he said. "We are in touch with foreign activists who will join us in coming days and weeks. We will continue throughout the summer." The activists are trying to draw attention to life in the West Bank under Israeli occupation, including travel restrictions. Israel controls all access to the territory, which it captured in the 1967 Mideast war and which the Palestinians hope to make part of an independent state, along with Gaza and east Jerusalem. Israel has been jittery about the arrival of foreign activists since a deadly naval raid on an international flotilla that tried to break Israel's blockade of the Gaza Strip last year. Recent anti-Israel protests, including deadly clashes along the frontiers with Lebanon and Syria, have added to those concerns.